I made the decision not to complete this term of college. There are a few reasons why, one of them being the cost, another being that it was funeral work and I didn't feel that I would get much use out of it. I have really missed going to college of a Thursday evening and spending a few hours with the girls that I have met there. 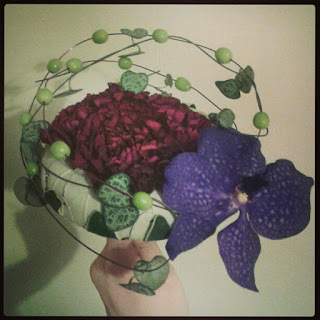 Last night was a little different though as there was a one off workshop covering bridal bouquets. I am a little disappointed, it isn't what I thought we would be making. It also probably didn't help that it's not at all what I would choose, I'm more of a traditional girl myself. But it was an evening with the girls and we did learn some new techniques, plus it was a chance for me to practise some of the techniques we used last term, seeing as I'm taking a few weeks out (I will be going back to complete the last term after Easter) So no more college flowers from me now until after Easter, I can't wait :) I've really missed it. Hello Gem, it's a shame you are going to miss your friends and the social side of the classes, although imagine how much fun you'll have catching up on all the news when you get back together with them! I brand new to commenting but I've been reading your blog amongst some other lovelies too, now I have just posted my own very first blog I'm feeling cheeky enough to join in! You do have alot of fun out and about, it inspires me to try something new. I do like the bouquet you made and can see it would appeal to lots of ladies. I made my own bouquet and for my bridesmaids from dried flowers, it was a Winter Wedding and soooooo many years ago that it scares me! I bet you'll be making some smashing Summery extravaganza's on your return to the world of flower power, something fun to look forward to. An Evening With The Stars.